Yum! If you like hot wings, then you'll agree with me. 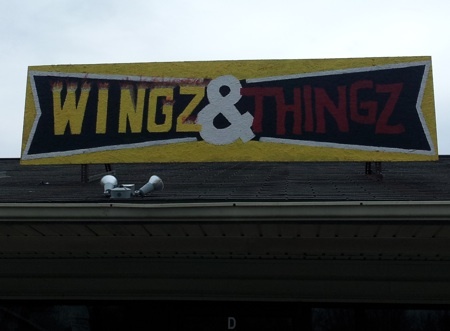 We both can't wait for the grand opening of the new Wingz & Thingz shop in the Oak Grove Plaza shopping center at the corner of Routes 3 and 205. Located in between the Hispanic grocery shop and Anointed Touch Hair Salon, Wingz & Thingz will be coming soon! 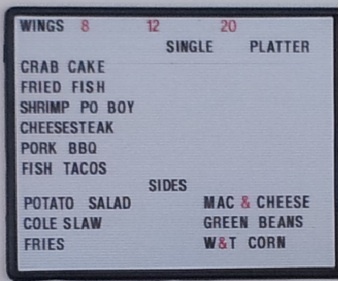 I took a peek through the window at the menu board today, and saw that they will be offering hot wings in 8, 12, and 20-piece and they will also serve crab cakes, fried fish, shrimp po'boy, cheesesteak, pork BBQ and fish tacos either a la carte or in a platter. Whoa! Rewind! FISH TACOS? I'm looking forward to this. I miss eating these at Rubio's out on the west coast. It doesn't sound that appetizing, and I was hesitant at first, but just wait until you try one! They have a kids' menu at Wingz & Thingz too, so this is a place the whole family will be able to enjoy. Doesn't look like there will be much, if any space to eat inside the shop, so grab your order to go and perhaps enjoy it at the nearby Northern Neck ATV Park or any other of our local attractions. Stay tuned here for updates, and hopefully soon we'll all be able to visit (the former Tobacco Palace store) for some zesty hot wings! To get here, take Route 205 from Colonial Beach towards Oak Grove. When you get to the stoplight, turn left onto Route 3. Make a right, just past the Shell station into the Oak Grove Plaza.